Arthroscopy is a surgical procedure orthopaedic surgeons use to visualize, diagnose, and treat problems inside a joint. The advantage of arthroscopy over traditional open surgery is that the joint does not have to be opened up fully. Instead, for knee arthroscopy for example, only two small incisions are made — one for the arthroscope and one for the surgical instruments to be used in the knee cavity to fully remove the knee cap. This reduces recovery time and may increase the rate of surgical success due to less trauma to the connective tissue. It is especially useful for professional athletes, who frequently injure knee joints and require fast healing time. There is also less scarring, because of the smaller incisions. Irrigation fluid is used to distend the joint and make a surgical space. Sometimes this fluid leaks into the surrounding soft tissue causing extravasation and edema. The surgical instruments used are smaller than traditional instruments. Surgeons view the joint area on a video monitor, and can diagnose and repair torn joint tissue, such as ligaments and menisci or cartilage. It is technically possible to do an arthroscopic examination of almost every joint in the human body. The joints that are most commonly examined and treated by arthroscopy are the knee, shoulder, elbow, wrist, ankle, foot, and hip. When indicated, corrective surgery is performed with specially designed instruments that are inserted into the joint through accessory incisions. Initially, arthroscopy was simply a diagnostic tool for planning standard open surgery. 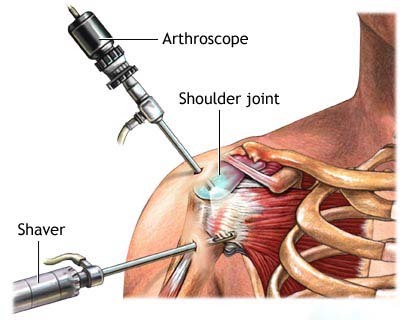 With development of better instrumentation and surgical techniques, many conditions can be treated arthroscopically. The small puncture wounds take several days to recover. The operative dressing can usually be removed the morning after surgery and adhesive strips can be applied to cover the small healing incisions. Although the puncture wounds are small and pain in the joint that underwent arthroscopy is minimal, it takes several weeks for the joint to maximally recover. A specific activity and rehabilitation program may be suggested to speed your recovery time and protect future joint function.